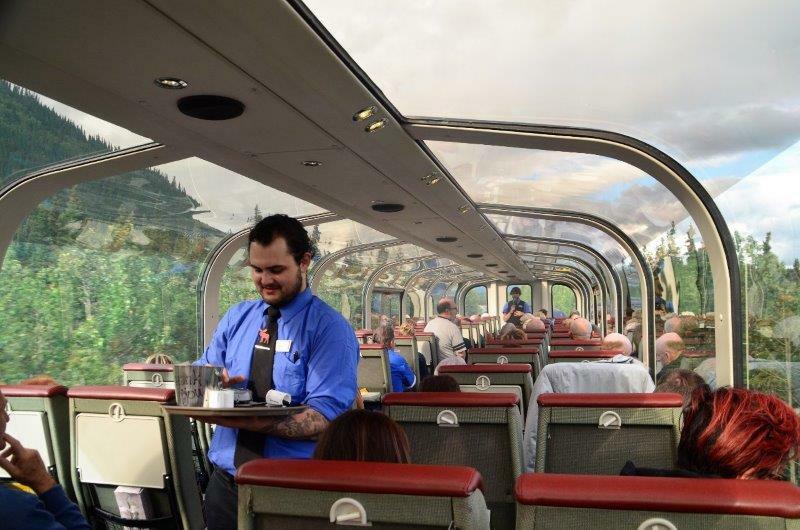 After an early breakfast, we left the ship for the last time and boarded the Princess Tours Ultradome rail cars, taking us on the 9-hour trip direct from the ship to Denali National Park. On the way we went through the Whittier Tunnel (or the Anton Anderson Memorial Tunnel to give it its’ correct name). What an experience. It is the second-longest highway tunnel and the longest combined rail and highway tunnel in North America. We saw many parked cars waiting for their scheduled access times at each end. It is a single highway lane with the railway tracks slightly beneath the surface of the road. We hadn’t heard of this tunnel before, and as we made the 10-minute journey, it was mind-boggling to think that we were travelling in a single lane designed for motor vehicles and trains travelling in both directions. The countryside is lush and green. We’ve left the rain behind and we really enjoyed the experience of travelling on a luxury train with attentive staff, lovely food and gorgeous scenery. We even saw some moose along the way. Arrived at our accommodation, the Denali Princess Wilderness Lodge, which was in a lovely setting. Warm and comfortable, but the mattress and pillows a bit too hard for my liking. That night we went to a theatre restaurant in the grounds. The waiters doubled up as entertainers. The entertainment was reasonably good, but the food was average. Not particularly hot and with our waiter so busy on stage, when we looked around we were the only table to miss out on a pot of coffee. However, after being away for so long, if we’ve only had these couple of minor inconveniences to complain about, I think we’ve been pretty lucky and the scenery next day more than made up for it when we went on a tour of Denali National Park. This morning we entered Glacier Bay National Park. Comprised of 3.3 million acres of mountains, glaciers, forests and waterways, it is a highlight of the Inside Passage and part of the 25-million-acre World Heritage Site. One of the National Park Rangers came onboard and provided a running commentary about the area, its history and wildlife as we made our way to Margerie Glacier. The temperature has dropped to around 6 deg (c) and there are showers of rain, but nothing can take away from the breathtaking sight of this glacier, soaring 20-25 storeys high and over a mile wide. As we sat with our chairs pulled close to the sliding glass doors, a waiter arrived with all the ingredients for Irish Coffees, which he made for us to enjoy without having to leave the warmth of our stateroom. The captain took the ship as close to the glacier as was possible, and we enjoyed the view from our balcony for around half an hour, after which he turned the ship for those with balconies on the other side. What a spectacle! Every so often there was a thunderous roar of an iceberg as it calved into the icy water, the term used when chunks of ice break off glaciers and fall into the water. We looked for wildlife but only some seals were in evidence. Tonight there was a formal dinner and we were invited to the captain’s table. This only occurred because most of the passengers had not done much cruising. We don’t stand a chance of this happening on the larger ships, so we made the most of it! We are coming to the end of our cruise. Tuesday, we sailed into College Fjord and saw more glaciers on both sides of the ship, so we made the most of the morning, basically drinking coffee and enjoying all the spectacular scenery. Busy afternoon as there were bills to be paid and bags to be packed – tomorrow morning we will arrive in Whittier and say farewell to the Island Princess. Skagway marks the most northern point of Alaska’s Inside Passage and we arrived at Railroad Dock early this morning looking forward to seeing the birthplace of the Klondike gold rush. There was no shortage of jewellery shops with staff just waiting for us to arrive in town, all of them trying to entice us in with “special deals” on tanzanite. I resisted! I was more interested in looking at the restored storefronts and wooden sidewalks, which makes you feel that you’re stepping back in time. Skagway is now a restored gold rush town and the headquarters of the Klondike Gold Rush National Historical Park. We started off the day experiencing the legendary White Pass Trail of ’98 from a different perspective; travelling the Klondike Highway by coach over the White Pass Summit, into Canada’s Yukon and ending with a ride on board a vintage car of the historic White Pass & Yukon Railroad while our train agent recounted fascinating local legends. The weather is noticeably cooler at 17 deg (c). Also cloudy, so hope it doesn’t rain! While on board we had the opportunity to meet Aliy Zirkle who, together with her husband Allen Moore, has been involved with sled dogs in Alaska for over 20 years. She has raced the Iditarod every year since 2001 and is the first, and only woman to have won the Yukon Quest. We had lots of questions about long distance sled dog racing and she gave a very interesting and informative talk and took the time to walk through the train to talk to everyone individually. The White Pass & Yukon Route Railroad is one of the precious few places in the world where you can take an authentic journey back in time, witnessing the engineering wonders of this railway and the same breathtaking scenery and rugged terrain that the gold seekers experienced during their race north to the gold fields over a century ago. After our train trip, we jumped on the coach for the trip to Liarsville Gold Rush Trail Camp. Liarsville got its name when journalists, dispatched to the gold rush, went no further than this location and invented tall tales about how easy it was to find gold. Nothing could have been further from the truth. We had a delicious baked salmon lunch, all you could eat, a walk around the recreated tent city then moved on to the show tent with some very talented performers, singing and entertaining in a funny melodrama, not to be taken seriously! Then a lesson in gold panning, where everyone found a few flakes of gold in their pan if they did it right, and even a little baggie provided to take it home in. Our little bits of gold looked very small indeed by the time we bagged them. But it was fun, and we enjoyed it immensely. To end our tour, we were dropped off in town at the famous (infamous, maybe?) Red Onion Saloon. This used to be a dance hall, saloon and bordello. We went upstairs for a champagne tour of the Brothel Museum conducted by one of the “madams” dressed in brothel attire, complete with money tucked into her dress. She was very entertaining, practically everything she said was a play on words, but all in (reasonably) good taste and she had us laughing as she explained the workings of the brothel. It was fun, we learnt some history and saw two of the 10 small cribs (rooms) with the period furniture just as it might have been in the day. Also a beautiful dress that was discovered under the floorboards. Interesting to note that as a customer chose a girl, the bartender would take one of 10 dolls from behind the bar and lay it down. Once the customer came downstairs, the bartender would sit the doll up and then everyone would know she was available again. We didn’t have to be back onboard until 8.00pm, so there was plenty of time to explore the town and the ship was very conveniently located within walking distance.